You may heard of the Paleo Diet, and are also unaware what the diet consists of. 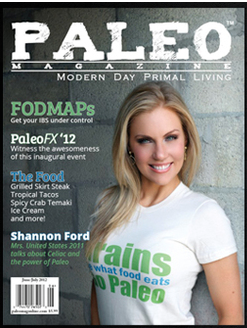 The paleolithic lifestyle also known as the Paleo Diet, is a diet that attempts to recreate or endeavors to imitate the eating patterns of our ancestors lifestyle, who lived 1000’s of years ago. They did not eat food that was processed, refined, cooked with toxic oils, or that contained sugar, unlike the majority of the foods that we eat today (The PaleoSecret). There are a small number of cultures in the world today, who continue to live a paleolithic hunter-gatherer lifestyle. Those who live in a modern society cultures, try to recreate elements of a paleolithic lifestyle, and do so in an attempt to improve or enhance their health, fitness and happiness by avoiding the common diseases that most of society faces today, which include obesity, cardiovascular disease, metabolic syndrome, allergies, depression, and chronic stress. The paleo diet encourages eating generous amounts of saturated fats like coconut oil and butter or clarified butter. The diet also promotes not using oils made from vegetables, or that are hydrogenated and partly-hydrogenated including, but not limited to, margarine, soybean oil, corn oil, peanut oil, canola oil, safflower oil and sunflower oil. Olive oil and avocado oil’s are encouraged for consumption, but only use them in salad dressings and to drizzle over food (PaleoLeap – Paleo 101). 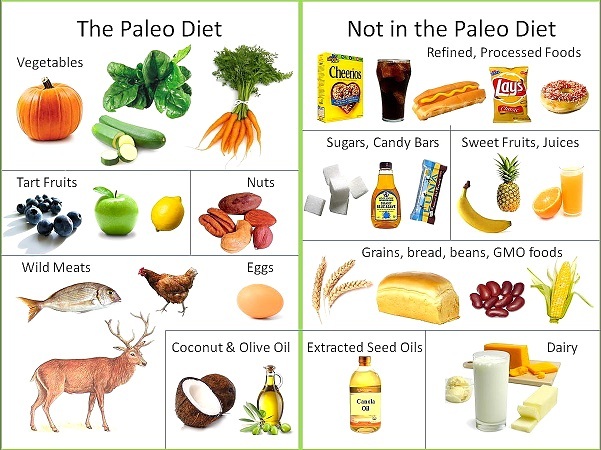 A paleo diet is neither vegetarian or vegan. Paleo eaters eat meat, unlike vegetarians, though they will eat dairy or eggs (depending on the person), and unlike vegans who eat no meat at all, including the by products of animals, such as dairy products, eggs, and even honey. 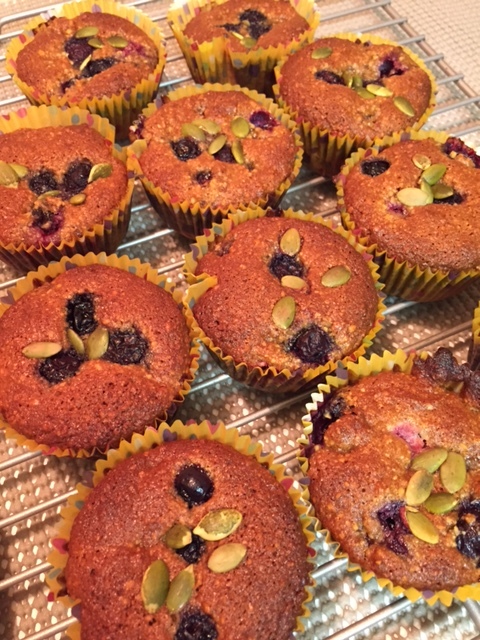 Now for our featured recipe: Blueberry Muffins Paleo Style, and here is what you will need. 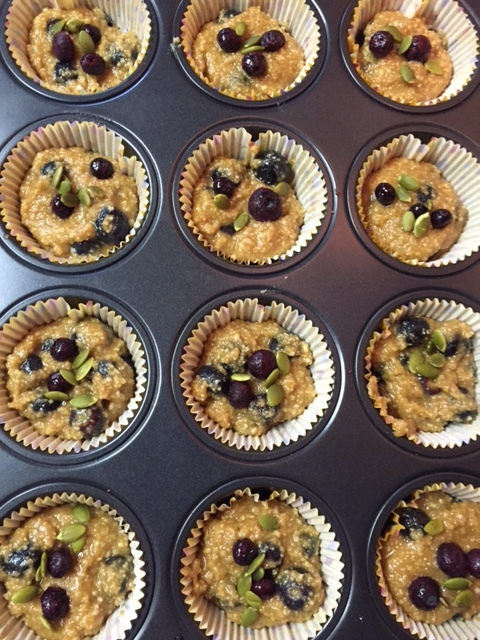 Preheat the oven to 350 degrees and line a 12 mold muffin pan with baking cups. In a large bowl, whisk the dry ingredients, making sure there are no lumps. In a medium bowl, whisk together the wet ingredients, then combine the wet ingredients with the dry, and incorporate together. Next fold in the blueberries. Divide the batter among the 12 muffin molds, filling each cup 3/4th of the way. Top with pumpkins seeds and a few berries. Bake for 25 to 30 minutes, or until the tops are a deep golden brown. Enjoy some other desserts using alternatives to whole wheat or grain flour, both Paleo approved. Fat in your diet: good or bad? This entry was posted in Dessert, Gluten Free, Paleo and tagged Anti-inflammatory, Apple I, Bell pepper, Bone density, Cake, Cannabis (drug), Carrot cake, gluten free desserts, Muffin, Paleo desserts, Sandwich, Teaspoon. Bookmark the permalink.